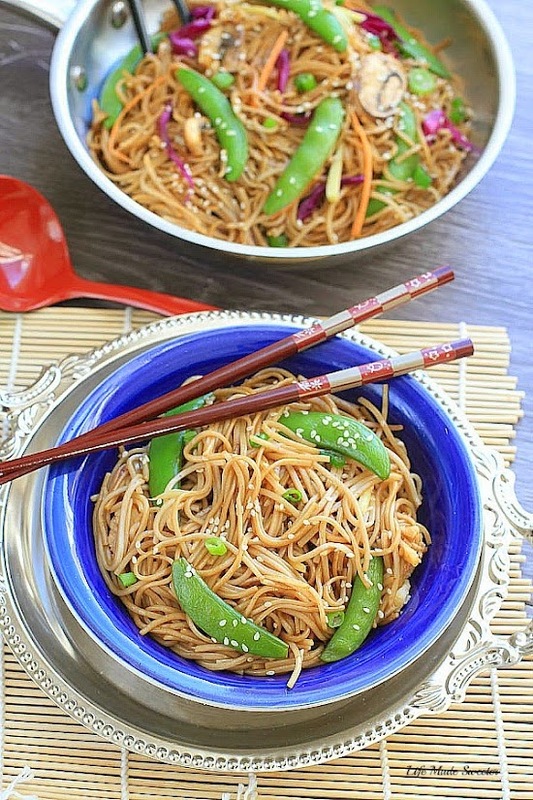 Flavorful sesame ginger soba noodles is an easy dish to customize and comes together quickly in just 20 minutes. Hope you guys had a great weekend and are staying warm! It’s bitterly cold here right now so we’ve been burried underneath tons of layers and fuzzy blankets. Plus consuming loads of hot tea and cocoa along with oodles and oodles of comfort food like these Sesame Ginger Soba Noodles. I love cooking with soba noodles because they are packed with fiber and made using buckwheat seed so they don’t make you feel weighed down like regular wheat based pastas. You can find soba noodles in the international foods section of most grocery stores but if you can’t seem to get your hands on them for some reason, then feel free to sub in your favorite thin pasta noodles instead. This light soba noodle dish is incredibly simple to make using just a few staple ingredients in your pantry. They take about 20 minutes to put together start to finish and are full of rich, savory flavors and taste equally delicious when served warm or cold. They make an easy weeknight dish and you can easily swap out the veggies for what you have on hand or add some protein to make it a complete meal. I am always trying to sneak in veggies into my dishes so for this particular recipe, I used snap peas, carrots, red cabbage, mushrooms and tossed in some green onions at the end. Bring a large pot of water to a boil, cook the noodles according to package instructions or until just tender, stirring occasionally, about 4 minutes. Drain the noodles and rinse under cold water. Meanwhile,whisk together all the ingredients for the sauce in a small bowl. In a large nonstick frying pan over medium heat with some oil, add the ginger and garlic and stir until fragrant, about 10 seconds. 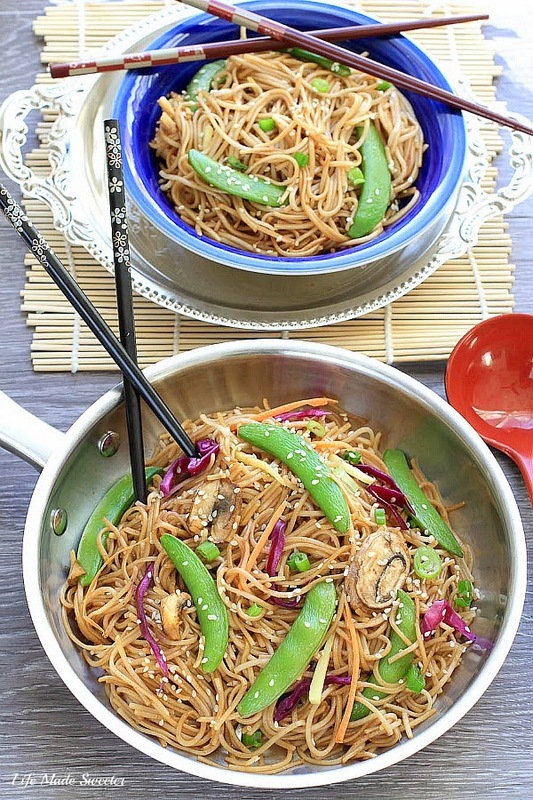 Add the mushrooms, snap peas, cabbage and carrots and continue to stir fry for about 3-4 minutes. We want the vegetables to remain slightly crunchy. Pour in the sauce and mix together. 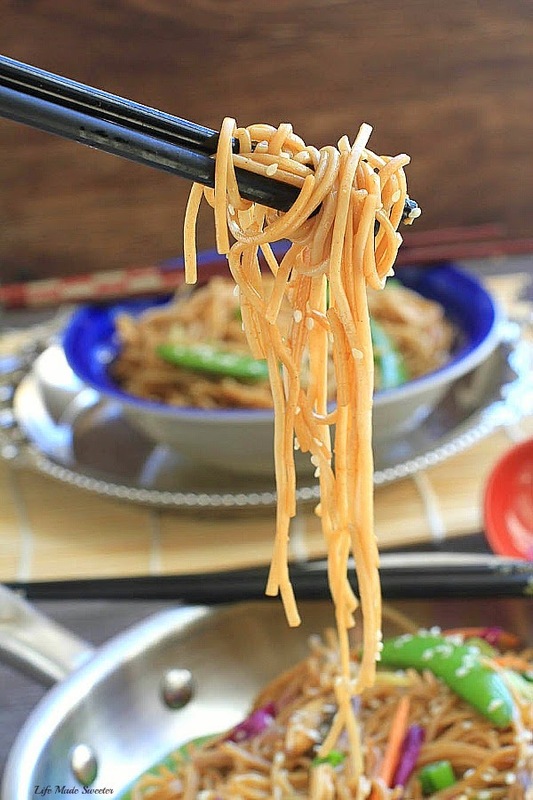 Toss in the noodles and using tongs, coat the noodles with the sauce. Toss in the sesame seeds. Serve and top with green onions and fresh cilantro if desired. 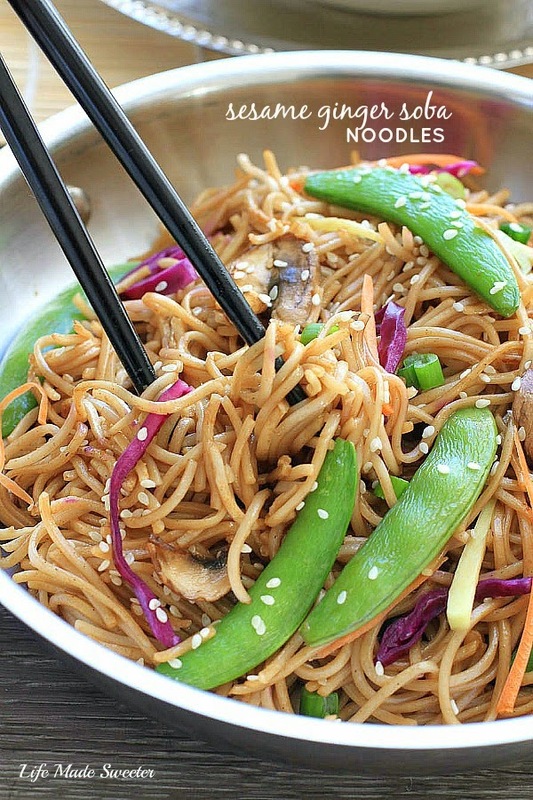 NOODLES: Feel free to use your favorite noodles or pasta instead. MAKE IT GLUTEN FREE: Use certified gluten-free, all buckwheat soba noodles and use tamari instead of regular soy sauce. VEGGIES: Feel free to substitute other seasonal produce or leave out instead. PROTEIN: Add protein of choice if desired.